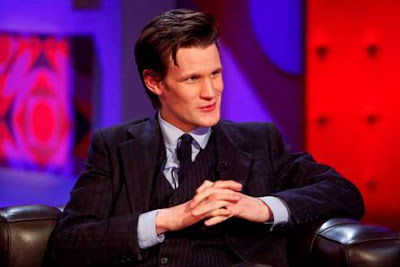 New Time Lord Matt Smith talks about becoming the Doctor: "My Doctor [is] clumsy, a little reckless, [but] becomes more assured as the series develops." He also reveals: "I couldn't tell anyone for three months," and says: "To my mind it's the best part in British TV history." He tells Jonathan that he took advice from David Tennant and that he's eager to take on his mantle: "I spoke to David briefly, he said 'enjoy the ride'." On the TARDIS, he reveals there have been some changes: "It's bigger on the inside, has different levels, other rooms including a library, [and is] a different shade of blue outside." Finally, he says he's here to stay: "I hope to do at least another year, it's a wonderful part and I want to keep it."